So it seems that whether you are a climate-change denier who just wants to keep on mining coal and burning oil and gas, an advocate of tech-based solutions like CCS and nuclear, or a total greenie who sees our future energy needs met by geothermal energy, hydro-electricity, and other renewables that require efficient energy storage mechanisms (i.e. lots of pumped storage reservoirs), it seems that your preferred energy source comes with a risk of generating earthquakes. Which in turn begs a really important question - for a given operation, what (if anything) will determine the maximum possible earthquake magnitude that your activity will produce? 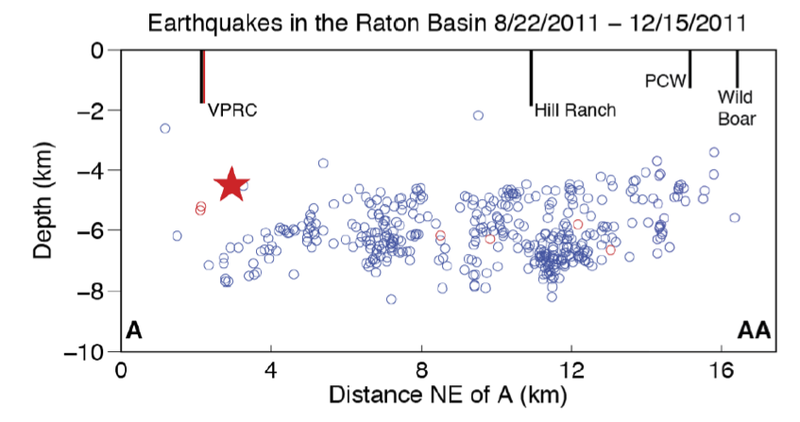 This is a really important question both for human activities, as well as seismologists who work on natural seismicity: what is the largest earthquake possible in a given setting? 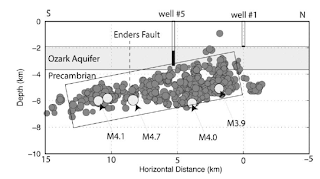 where G is the shear modulus of the rock, A is the cross-sectional area of the earthquake rupture, and D is the average dislacement that one side of the fault moves relative to the other. So you can see that, if there is no limit to the size of a fault (which controls the rupture area), there is no limit to the maximum magnitude that an earthquake can be. 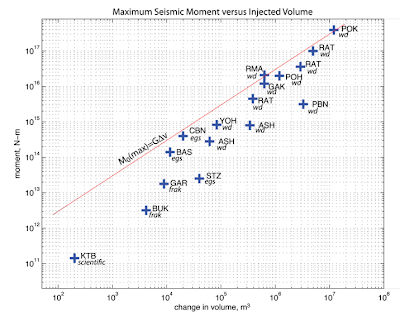 In reality, however, the the thickness of the earth's crust probably imposes an upper limit on the size that an earthquake can be, which is why even the largest earthquakes (on Earth at least - who knows, a planet with a thicker crust could probably have larger earthquakes) don't ever seem to get much bigger than M9. BUK is the famous fracking-induced Blackpool earthquake. RMA is the Rocky Mountain Arsenal. YOH is Youngstown Ohio. PBN is Paradox Basin, Colorado. GAK is Guy, Arkansas. BAS is Basel, Switzerland. GAR is Garvin County, Oklahoma. STZ is Soultz, France. RAT is the Raton Basin, Colorado. TotalMoment = G x VolRockMined. 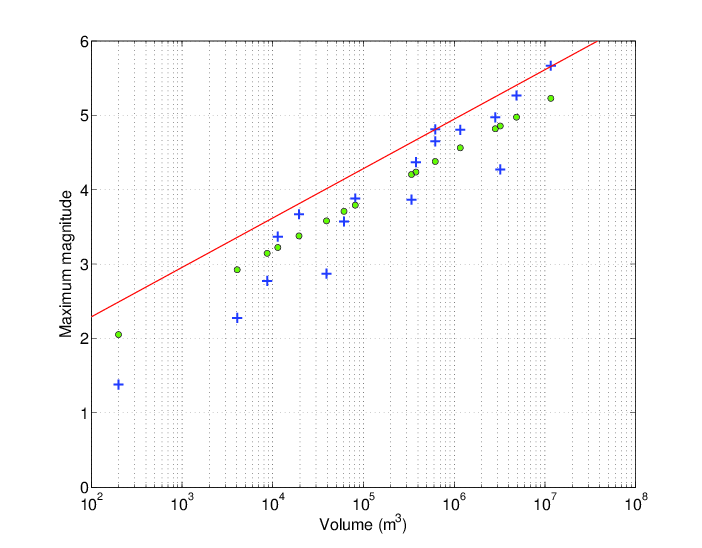 This is the equation plotted in the above figure, and you can see that it does a good job of fitting the data. But the key thing to note with the McGarr equation is that it is empirical, it does not have any real physical basis - i.e. 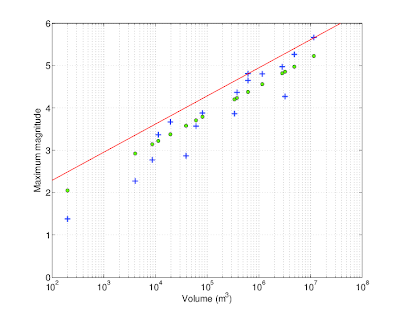 it is something that is observed, but it doesn't really explain WHY the maximum magnitude should be controlled by the volume of fluid injected (instead of, say, the rate of injection or the change in pore fluid pressure). A new model for Mmax has been developed by Serge Shapiro of the Freie University, Berlin, which I find very interesting. The Shapiro model suggests that Mmax should be controlled by the size of the fluid-affected zone. 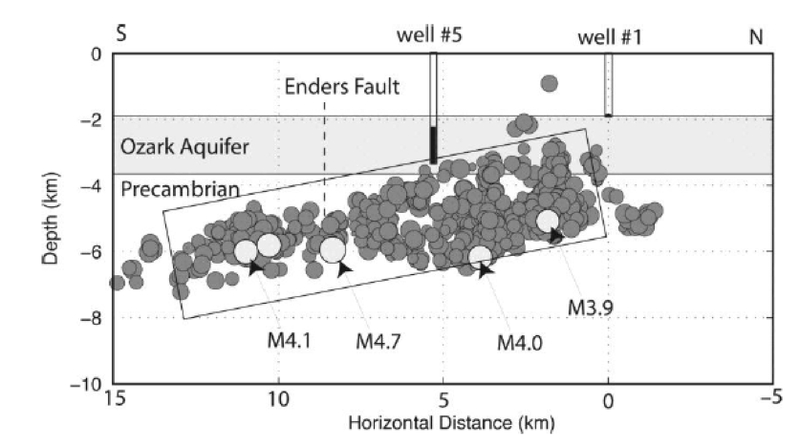 So an M3 quake needs a fault of radius 15m, and an M6 quake needs a fault of radius 500m. 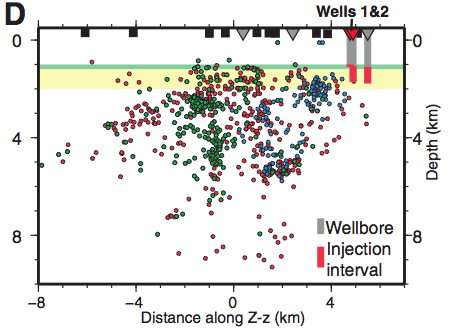 So, could the size of the area stimulated by fluid injection control the size of the earthquake? Lets consider fluid injection into a completely homogeneous porous rock. The fluid-saturated zone will spread as a sphere (assuming it has similar density to the in situ fluid). The radius of this sphere can be easily calculated from the volume injected. Shapiro argues that the size of the largest fault that can be triggered must scale with the radius of the injected fluid volume. In the plot below, the green circles show Mmax for the McGarr data, which I have calculated using the Shapiro model. You can see that, much like the McGarr model, they fit pretty well. So do we now have a better model to explain Mmax? Unfortunately, I don't think we do. When you look in more detail at the induced events, you can see that some of the key assumptions of the Shapiro model are not met. The Shapiro model requires that events occur within the immediate radius of the injection zone. The figures below show induced seismic events from Arkansas, Oklahoma and Colorado, with the injection wells marked. A common theme is that the majority of events occur well below the injection point. 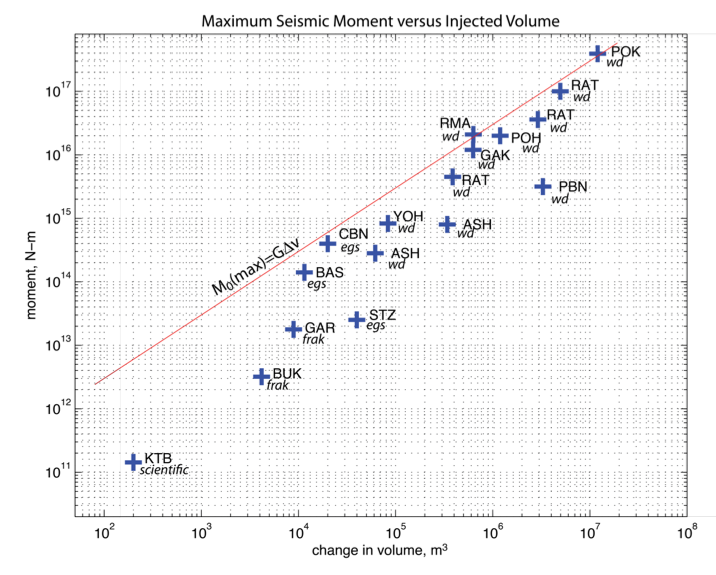 Perhaps some of the initial seismicity is triggered in the injection interval, but the majority of the triggered faults lie outside the zone that is directly influenced by injection. The Shapiro model explicitly assumes that the triggered faults lie almost completely within the injection-influenced interval. I think that the Shapiro model is a great attempt to simplify a difficult problem, but to me it seems that more complicated effects involving stress transfer through many layers of rock are acting, and need to be taken into account, to understand the triggering of these faults. This takes us back to the title of this post: predicting Mmax is still a conundrum. The McGarr model seems to fit the data, but it is only empirical, there is no real physics behind it. The Shapiro model also fits the data well, and has a physical mechanism of control. However, the suggested controlling mechanism doesn't stack up when the events are studied in more detail. A physically realistic, empirically verified model to predict Mmax still eludes us. We are usually able to explain post hoc why a particular operation triggered an event. 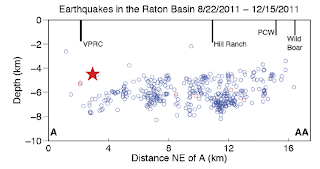 However, we are still not very good at predicting in advance whether a project will induce larger seismic events. If you can come up with a better method, then do get in touch, because a solution will be extremely valuable in a range of industries as discussed above. In the meantime, we are left with the empirical McGarr equation as our main guide. It should of course be remembered that the McGarr equation does not tell you the maximum magnitude you will get in an operation. The maximum magnitude produced during most operations fall well below the McGarr line. The McGarr line tells you the maximum magnitude you could get if you are very unlucky.